Daylight Savings time did NOT end this past weekend. You may recall due to the Energy Policy Act of 2005 -- daylight savings time is now typically three weeks longer each year. Instead of setting clocks back the last weekend in October (2006 and earlier schedule), we will now move our clocks back by one hour on Sunday (2am) 4 November 2007. If the change (or in today's case, lack thereof) caused you momentary confusion -- you're not alone. Today on KXL we talked about phones that (if not patched last Spring ahead of the first schedule change) were displaying the wrong time. Then there's the inexpensive... (under twenty bucks, mine shown at right) clock that you wouldn't think knew which weekend to "Spring Forward" or "Fall Back" -- yet, in fact it does. The clock maker Chaney Instrument Company refers to this product with the brand name AccuRite and boasts a (patent-pending, though perhaps now patented?) Set & Forget® technology. You can read the Jan. 2004 press release heralding this new time-saving (if you'll pardon the pun) device here. Problem is -- the clock's internal pre-programmed calendar is hard-coded to the old daylight savings time with apparently no way for it to be upgraded. This means, you've guessed it -- now I am forced to set the clock FOUR times a year. 1:30 PM -- Update 1: A very gracious (and helpful) Customer Service Manager tells me, "The clocks are not technically defective." Fair, I suppose. I've been referred to the marketing department for additional information, I'll post an update when available. Blog Report is a periodic look at what's happening in the blogosphere. A means of sharing fun, interesting, and noteworthy blogs and the bloggers that post them. You've seen the emails from your friends, coworkers, and perhaps even family members -- excessive and/or unnecessary use of quotation marks. 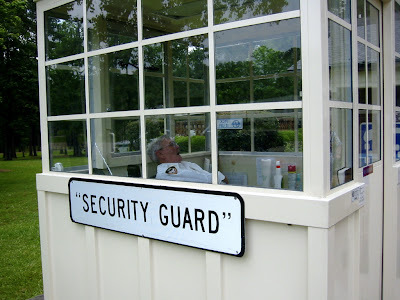 One blogger has made it her personal mission to highlight the silly and unusual use of quotes. With nods from the Associated Press and a "Site of the day" designation from Yahoo! recently, it seems others are taking, ahem... "notice". Know of a "blog" you'd like to see highlighted here? Email: blogreport (AT) brianwestbrook (DOT) com. I might even "quote" you in the post (couldn't resist!). While we send our thoughts and well-wishes to those affected by the Southern California wildfires, Google has something of an (incidental) ironic observation. The search engine tracks popular search terms and presents a relative scale (using phrases from "mild" to "volcanic") of their popularity for a given day. On Monday 22 October 2007, "california wildfires" was ranked on the "hotness" scale as On Fire. Check it out here (or click the screenshot above). View the current list of Hot Trends using the Google Trends tool. Did you know that the average nightclub consumes 150 times the power of a typical 4-person household? This and other energy conservation observations serva as basis for a dance floor that will turn the kinetic energy of those dancing into electricity to fuel the lights, sound, and other power-guzzling needs of a nightclub. It'll take a spin in Rotterdam, Netherlands soon and you can read all about it and check out the photos on the PopularMechanics site. Happy (green) dancing! If the camera adds ten pounds, there's a new way to give your digital photos a diet. You may recall my review of Picnik a few months back on Portland's Morning News -- well now the online photo editing site has gone big-time! Launching its 1.0 product (no more beta!) and adding a set of Premium features that for most users will rival the functionality of Adobe's Photoshop -- the guys at this Seattle-based startup aren't wasting any time. TechCrunch has a review of the Flickr / Picnik integration. Now Flickr users can do more than crop and rotate images stored on the Yahoo-owned photo sharing site. Microsoft earlier this morning announced plans to offer users an online add-on for its popular Office productivity suite. The service, Office Live Workspace, gives users the ability to post 1000 documents online and is expected to be released into beta later this year. In February Google released an enterprise version of its free applications Docs & Spreadsheets. Many are seeing today's announcement as a response to the Google Apps product. For more information, check out this story from today's NY Times. To compare Office productivity suites, I recommend this chart over at Wikipedia.